Another lens battle today…just a quick one. I have the new Olympus 25mm f/1.8 in for review this week and I thought I’d put it up against the venerable and outstanding Panasonic Leica 25mm f/1.4 DG Summilux. These two lenses are both priced relatively similarly, given the difference in maximum aperture. The Olympus comes in at $399, while the Panasonic Leica charges a bit more for that 2/3 stop of extra light, at $529. The normal prime space in Micro 4/3 is becoming a crowded area. On the wide end of normal, Panasonic has had their excellent pancake design 20mm f/1.7 for years. They later released the Leica branded 25mm f/1.4 tested here. That lens has been a mainstay in the system for some time, and really the only choice for a 50mm equivalent lens with fast aperture and autofocus. Voigtländer has also had a player in this range for a few years as well, with the manual focus and very fast 25mm f/0.95 Nokton. Olympus has been strangely absent from the normal focal range until now, with the release of the 25mm f/1.8. While the new Olympus sacrifices 2/3 stop of aperture against the Panasonic, it comes with the benefit of being considerably smaller. The Olympus 25mm is a tiny lens and can easily fit in a jacket pocket. The Panasonic 25mm f/1.4 is a fair bit larger, but is still a relatively small lens. The Panasonic (200g) is about 50% heavier than the Olympus 25mm (136g). Both lenses have very fast and quiet autofocus and both are relatively well-built, though the focus ring on the Olympus 25mm feels a little less robust than the nicely gripped rubber focus ring on the Panasonic. 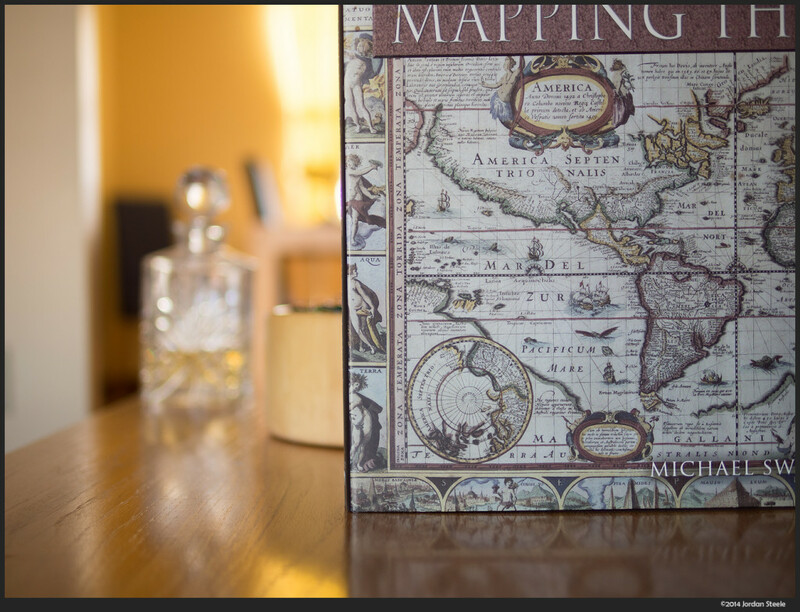 I’m using a similar setup to many of the other lens battles I’ve tested….a high detail target to provide information on resolution, with a faceted glass decanter in the background to provide specular highlights and help in evaluating bokeh. The test camera, the Olympus OM-D E-M5, was set on a tripod, triggered with the 2 second self time to avoid movement from pressing the shutter, and in-body IS was set off. Images were taken starting at f/1.8 and stopping down in one stop increments to f/5. The Panasonic also was tested at f/1.4. When switching lenses, the camera was left on the tripod in the exact position while the lenses were swapped out. Some notes: As you can see in the images below, despite both lenses being marked as 25mm lenses, the Panasonic Leica has a slightly longer focal length. I can’t say whether the Leica is longer than 25mm or the Olympus is shorter than 25mm, though in comparison to other lenses I own, I’d lean towards the Olympus being slightly shorter than marked. As a result on the Panasonic being slightly longer, the 2/3 stop aperture difference between the lenses is actually slightly more significant than would be expected. Below are the full shots of both lenses wide open. While the difference in depth of field and background blur isn’t huge, it is certainly noticeable, especially in the far reaches of the background. As you’ll see in the bokeh comparison on Page 2, the Panasonic seems to enjoy closer to 1 stop of depth of field advantage over its Olympus sibling. It is worth nothing that this is a single test at a single focus distance. I have not had a chance to do a formal test at further focus distances, but this test was chosen to give a nice balance between focus distance and shallow depth of field abilities. Focus distance was approximately 0.7m, which is somewhat close, but well short of the minimum focus distance of both lenses (0.25m for the Olympus and 0.3m for the Leica). Below are 100% crops taken from the center and near the upper right corner of the image frame. As the Panasonic is slightly longer, the corners don’t exactly match up, but that isn’t fully required for evaluation. To see the crops at full size, click the image, then click the green arrow at the bottom to enlarge to 100%. 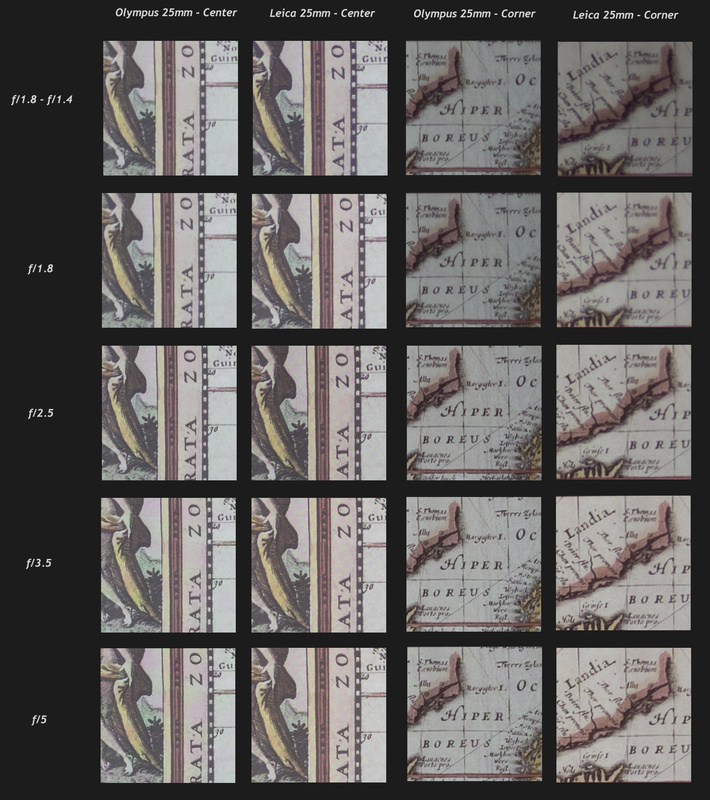 At the widest apertures, we have a bit of a split result. Both lenses are already very sharp from wide open across the frame. This is, in and of itself, a very nice result for both lenses. However, the Leica 25mm shows slightly higher resolution in the center, even at f/1.4, (and more noticeable by f/1.8) than the Olympus 25mm. However, as we get to the edges, the Olympus takes the lead, with a clear advantage in the corner at f/1.8. The Olympus’ cross frame sharpness at f/1.8 is rather remarkable. There is extremely minimal falloff in resolution as you get to the edges. As we get to smaller apertures, the Panasonic retains a slight lead in the center at f/2.5, but by f/3.5, the lenses are just too similar to worry about. Likewise in the corners, the Olympus stays visibly sharper throughout, though by f/3.5 the differences are extremely small. Overall, the two lenses are both very sharp at all apertures, with the Panasonic having a slight edge in the center and the Olympus having an edge towards the image borders. One other thing that is visible from these crops is the relatively higher level of vignetting on the Olympus. While both lenses are notably darker in the corners wide open, the Panasonic eliminates most of that corner shading by f/1.8, while the Olympus has to be stopped down much further to bring the vignetting to negligible territory. If you were to move the panasonic lens further back from the subject, so that the compositions are then equal, then the panasonic would pick up some more DOF. Then, perhaps at equal F-stops the background blur might be similar…. basically because the slightly greater magnification of the Pany lens would offset by the reduction of magnification realized when moving further away from the subject. Of course, as far as selective focus, DOF, blur and bokah, there is still the Pany advantage of F1.4 being its widest aperture. Yes, it would be equalized somewhat, and DOF would be identical at identical f stops, but the Panny would still have a little more blur due to the longer focal length. It’s a slight advantage, though (and the framing difference here isn’t huge either), but was worth noting. The lenses really boil down to whether you prefer size or the faster aperture, in my opinion. I don’t yet have either! So, it was good to read your assessment. I wonder how both of these lenses match up to the Four-Thirds version of the Leica/Panasonic 25mm f/1.4 that was meant for the Leica bodies way back when. To me, it seems practically perfect but there are always some sort of flaws, and with a 62mm filter size, it’s rather big compared to these two. Reading another such comparison between the micro Four-Thirds lenses, it seemed that they didn’t match up in maximum aperture–the Panasonic/Leica either being smaller or the Olympus being larger. You’d think engineers would be better at measuring, wouldn’t you? 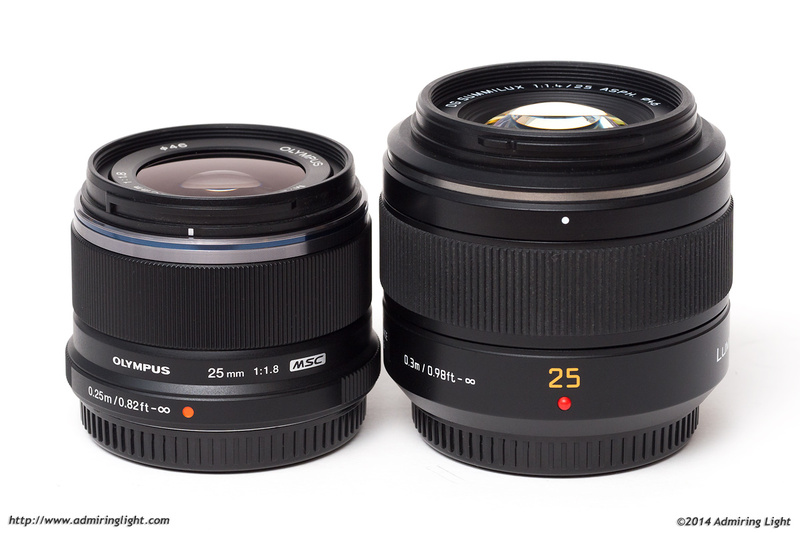 A comparison of these lenses vs. the Voigtländer 25mm f0.95 would be very interesting! Do you still have that lens? The Voigtländer 25mm, to my eye, is the M4/3 the gold standard for this focal length and the first native 25mm lens to be released for M4/3. So, comparing with to the Oly and Panasonic would be a no-brainer. Why does it have to be a lens “battle” ? Very nice test. One thing I prefer the Olympus for is the minimum focus distance. It does’t sound a lot of a difference, but when looking at the pictures taken by Robin Wong when comparing those lenses it is a big difference for close-ups of flowers or pets. Keep up the nice work! Thanks for taking the time to review and compare these two nifty 50s. Nice write up…like you, I value the bokeh and the extra light gathering of my Panasonic so I will be keeping it…but the small size of the Oly is appealing. Another property of the Oly that is appealing is the significantly closer focusing distance when compared to the Panny…that is REALLY a plus for the smaller lens. Alas it seems we just can’t have it ALL, LOL! Thanks for an interesting and thorough research! Would have liked to see the Pana 20/1,7 in there too, though. Last week I did a short (10 min) and not very scientific test in shop in Amsterdam with these two lenses on two my Panasonic cameras (G3+GF3) at f/1.8. Panasonic was a latest revision of H-X025E with special “nano-coating”, but still FW revision 1.0. = Olympus lens is much better balanced on both my cameras. Panasonic Leica almost requires a second hand to support lens. = Panasonic seems to be more contrasty or sharp comparing to Olympus at f/1.8. = Olympus lens is much faster to focus on both my [Panasonic!] cameras. On G3 I even had several focusing attempts with Panasonic lens, which is pretty unusual. On GF3, strangely enough, the same issue was not reproducible. So I bought …. Panasonic Leica, because like to use it more for art works and I like its f/1.4 a lot. My only hope that they would fix this focusing issue in a new version FW. I would be curious if you had an opinion about color. I’ve done some testing lately just to compare how the major MFT lenses produce color and I’ve found I tend to prefer the color of the Panasonic Leica branded lenses. The PL 25mm f1.4 and the PL 45mm f2.8 both produced what I felt were more saturated, higher contrast images. I know color rendition is subjective but it’s also very real. In my testing I took lots of shots of the same subject in the same light and got very different results. I’m surprised this isn’t commented on more or examined in comparison reviews. I still like my Olympus primes because they perform well in other regards but I’m looking forward to getting the new PL lenses because I’m expecting similar color performance with the new PL 15mm f1.7 and PL 42.5mm f1.2. I’ve found the same thing regarding contrast and color. I find the rendering on some Olympus lenses to be too pale. The PL25mm and the Panasonic 35-100mm f/2.8 seem to share similar contrast and color rendering properties. I strongly prefer photos taken with these lenses over photos taken with my Olympus 12-40mm f/2.8, 25mm f/1.8 and 45mm f/1.8. My suspicion is that it has to do with the different types of coatings they use. 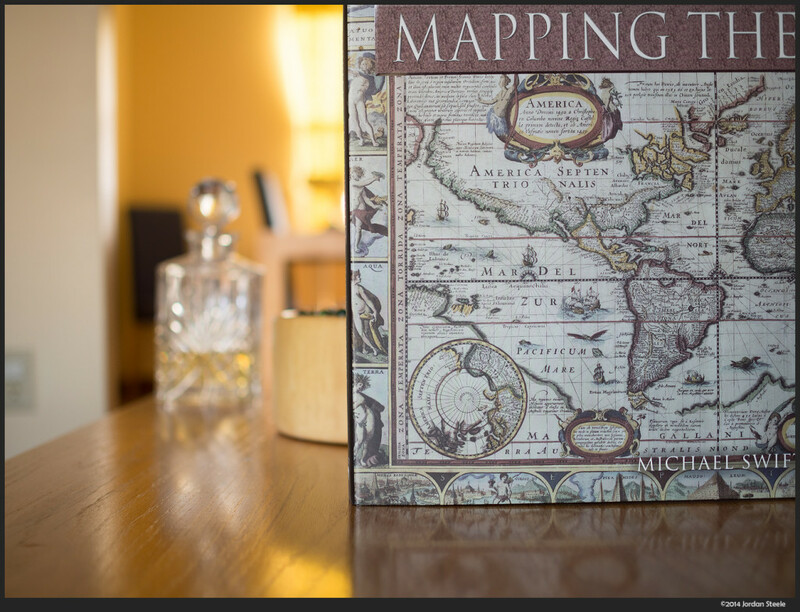 I do find the Oly 60mm f/2.8 renders quite beautifully. I’m also a fan of the Samyang 7.5mm f/3.5 fish-eye. Just got mine PanaLeica. Did a long research on the net and with looking at photo’s. The Olympus is very good, lighter and more close in focussing, but for my eyes the PanaLeica pictures are just ( a little) more beautiful. The difference is small, the price difference between a demo PanaLeica and a brand new Olympus was zere, so I bought the PanaLeica. And now I’m happy. Great site you have. Living with the opinion there are very little real life comparison sites of same range camera’s and comparable lenses, your site seams to be able to contribute to this. I came on your site searching for opinions about the Leica 25mm 1.4 m4/3 lens, but yesterday, and I spent a lot of time searching for the right camera before that, I was very much into the thought that there were no good sites comparing the outcome! of comparable bodies and lenses. From a hanging on gh2 user… business concepter, marketing consultant. Hmm. I have the PL 25 sitting on an OMD EM5 and even though the lens is beautiful (and big M43 speaking), what I cannot stand is the rattlesnake noise that is constant when using this lens. Its annoyance is such that I rarely use the lens and I am now seriously considering the Oly 25 and just trashing the PL 25. I don’t know if the rattlesnake exits on Pany bodies but it does surprise me that not much is written about this issue. If you try to turn off (or choose the 50/60 HZ, sorry I forgot) the “Flicker Reduction” setting on your camera, you most likely wont hear the rattlesnake noise anymore. I’ve tried it on my E-PL5 and from what I read on other forum, it works for EM5 too. The only thing I don’t like about the Panasonic 25mm are the CA in high contrast scenes. Particularly when shooting wide open.